The other day I entered a contest to name some yarn on Susinok's blog. She sells her handdyed yarn on etsy. This was the first time I entered a contest to try and name yarn. I thought the colors were so pretty! So this morning while checking email I saw a message from her stating that I was a runner up and would receive a hank of her beautiful hand dyed yarn!! My names weren't chosen, but that's alright. I'm very happy to be a runner up and can't wait to receive my yarn. It'll be my first time trying any fellow etsyian yarn! I also totally overestimated the amount of yarn I'd need. I bought 3 skeins and I only used about 1.5, so I'll have to figure out what to do with the left over yarn. I'm thinking I might make him some fingerless gloves because his hands have been getting cold lately. The pattern was super simple and actually fun to do. I wasn't bored with endless rows of stockinette stitch. The great thing is that they actually fit Trav and he likes them. He said that they are very warm. I'm on a sock roll and having a lot of fun. I'm currently finishing up another pair that has been suffering from second sock syndrome for almost a year. 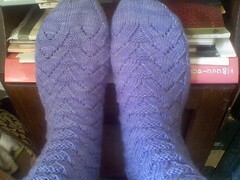 Besides the tank top I finally finished this pair of socks. I started these socks during the Olympics. So it almost took me a year to get them done. I don't know why I put these down!! The yarn is heaven!! It's so soft and surprisingly warm. It's artyarns ultramerino 4. It's definitely worth the price. 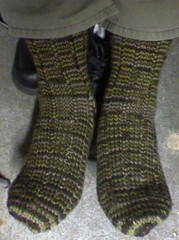 These socks took under 2 skeins of yarn. The pattern is very easy. I admit I was a bit intimidated when I saw that it was lace. Lace in a sock?? C'mon sometimes I have trouble with lace just as a rectangle! And on top of that doing lace with double pointed needles. I worried for nothing because the instructions were wonderfully written and the chart was easy to read. I wore these the other day and they felt sooo good. I now fully understand why everyone who makes/wears handmade socks love them so much. I can't wait to get more done for me. I finally have gotten sick and tired of having so many WIP (works in progress) laying around the house that I finally decided to start tackling them again. This is my first tank top I did. It's done in an acrylic/cotton blend. This got put to the side because of the endless amount of stockinette stitch. It just got so boring. 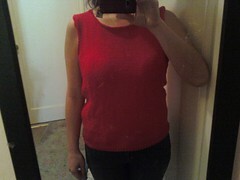 I was a tad disappointed with it because I messed up on sleeve edging. I didn't want to pick up stitches and knit so I decided to single crochet an edging around. BLAH!! I will most likely wear it as it fits pretty good. The pattern was easy but the construction seemed a bit different from other shirts I've done. I'm not sure if I'll make another one, but who knows? So I've learned that knitting blankets take me at least 5 times as long as crocheting them. This blanket took me just about 2 months to finish. Of course I wasn't working on it everyday so I probably could of finished in about a month. 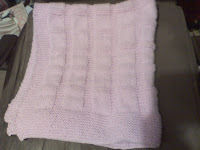 I did enjoy knitting this blanket as the pattern was simple yet it made a fun design. This blanket is part of my stash reduction plan for this year. So far I've used up 37 skeins of yarn! So next on my list is to finally finish my monkey socks which I started during the Olympics. I developed some serious 2nd sock syndrome. I'm actually already on the foot part so hopefully it'll go pretty quickly. I'm trying to finish up a few WIP's (work in progress) so that I can finally pick out and start a lace project. I'd like to enter another lace shawl in the fair this year so I'll have to get started soon. Plus I'm dying to start something nice and lacey.